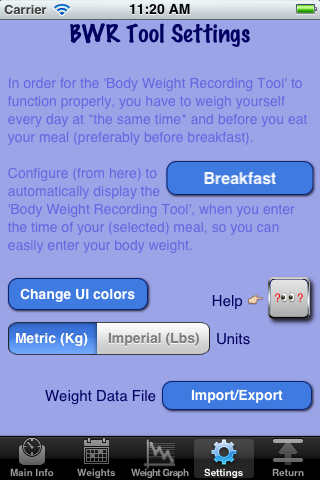 With the "Body Weight Recording Tool" you can enter your weight everyday and keep track of your weight changes. The proper way, to get the best results, is to weigh yourself at the same time each day, using the same scale and of course wearing the same clothes (ideally in the morning before eating breakfast). 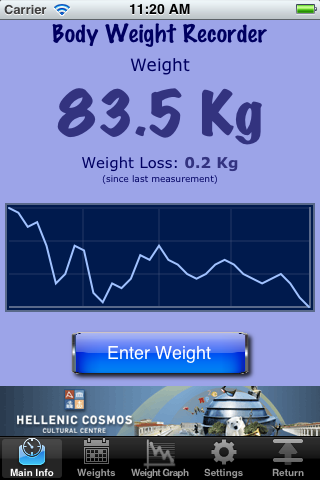 "Main Info": main screen that shows you basic information about your weight and a (small) graph of your weight history. From here you can access the Input Weight screen. 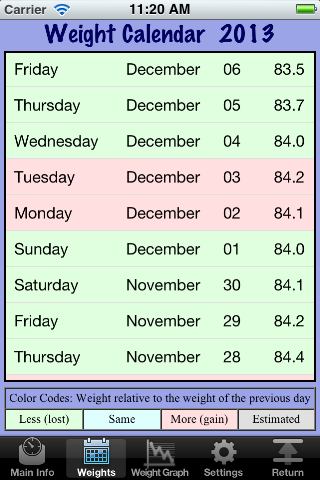 "Weights": The list of your daily measurements (colored according to their difference from the previous day). 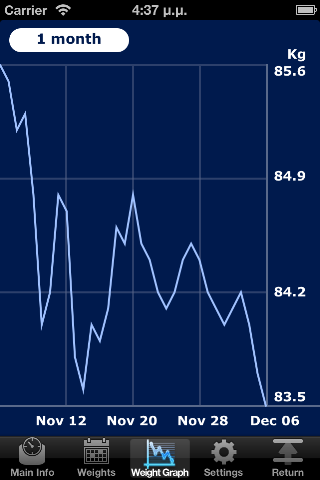 "Weight Graph": The full chart of your weight history (with several date range options & a rotation capability for a better view). "Settings & Tools": Here you can set various parameters of the "BWRT", its User Interface colors, as well as import your weight measurements from another application, or send them (along with the graph) via email. To help with the process, iEat5 will prompt you every day to import your current measured weight, after you enter the relevant¹ meal. ¹: as selected at the Settings screen.